Cinnamon Braided Rugs by by IHF Home Décor. The Cinnamon braided rug pattern has reds, browns and tans interwoven into a delightful design that is sure to spice up your room. These rugs will work in rooms that have browns tans or reds. This design is a classic that will fit country and primitive interiors. Available in many sizes in oval, rectangular and heart-shaped. 100% Jute. The braided construction makes it very durable. Made of 100% Jute. The braided construction makes it very durable. Manufactured and imported by IHF Home Décor. The Cinnamon braided rug pattern has reds, browns and tans interwoven into a delightful design that is sure to spice up your room. This rug will work in rooms that have browns tans or reds. Cinnamon oval braided rug which measures 27" x 48". Made of 100% Jute. The braided construction makes it very durable. Manufactured and imported by IHF Home Décor. The Cinnamon braided rug pattern has reds, browns and tans interwoven into a delightful design that is sure to spice up your room. This rug will work in rooms that have browns tans or reds. Cinnamon oval braided rug which measures 22" x 72". Made of 100% Jute. The braided construction makes it very durable. Manufactured and imported by IHF Home Décor. The Cinnamon braided rug pattern has reds, browns and tans interwoven into a delightful design that is sure to spice up your room. This rug will work in rooms that have browns tans or reds. Cinnamon oval braided rug which measures 36" x 60". Made of 100% Jute. The braided construction makes it very durable. Manufactured and imported by IHF Home Décor. The Cinnamon braided rug pattern has reds, browns and tans interwoven into a delightful design that is sure to spice up your room. This rug will work in rooms that have browns tans or reds. Cinnamon oval braided rug which measures 8' x 10'. Made of 100% Jute. The braided construction makes it very durable. Manufactured and imported by IHF Home Décor. The Cinnamon braided rug pattern has reds, browns and tans interwoven into a delightful design that is sure to spice up your room. This rug will work in rooms that have browns tans or reds. 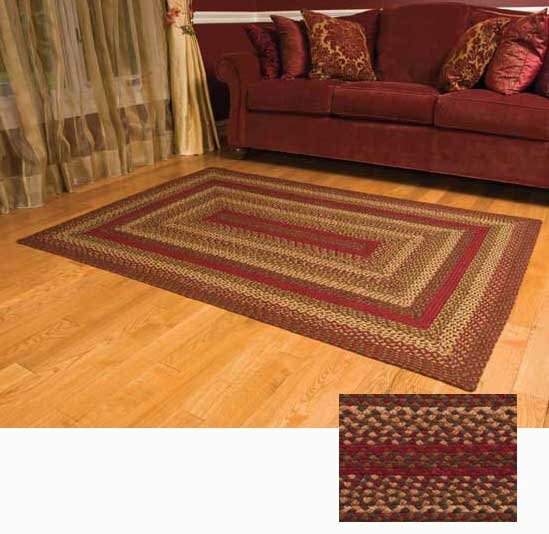 Cinnamon rectangular braided rug which measures 22" x 72". Made of 100% Jute. The braided construction makes it very durable. Manufactured and imported by IHF Home Décor. The Cinnamon braided rug pattern has reds, browns and tans interwoven into a delightful design that is sure to spice up your room. This rug will work in rooms that have browns tans or reds. Cinnamon rectangular braided rug which measures 36" x 60". Made of 100% Jute. The braided construction makes it very durable. Manufactured and imported by IHF Home Décor. The Cinnamon braided rug pattern has reds, browns and tans interwoven into a delightful design that is sure to spice up your room. This rug will work in rooms that have browns tans or reds. Cinnamon rectangular braided rug which measures 5' x 8'. Made of 100% Jute. The braided construction makes it very durable. Manufactured and imported by IHF Home Décor. The Cinnamon braided rug pattern has reds, browns and tans interwoven into a delightful design that is sure to spice up your room. This rug will work in rooms that have browns tans or reds. Cinnamon rectangular braided rug which measures 6' x 9'. Made of 100% Jute. The braided construction makes it very durable. Manufactured and imported by IHF Home Décor.